Boxing Legends of the Ring is a boxing simulation released for the SNES, presumably as a more realistic alternative to arcade-style boxing games like Punch-Out. 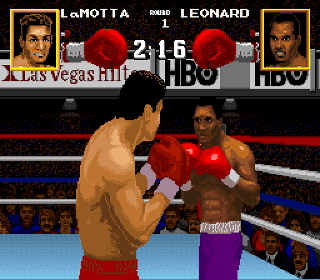 The game features 8 real life boxers, including Sugar Ray Leonard and Jake LaMotta (of Raging Bull fame.) You can fight through a single bout, a career mode where you create your own boxer and fight through all of the other boxers leading up to a title match, and Battle of the Legends mode, where all of the boxers participate in a single-elimination tournament to reach a championship bout. You can throw jabs, uppercuts, and body blows, and dodge in multiple directions. Your movement is restricted to a 2-dimensional plane parallel with the screen. The game seems cool on the surface, but the sheer volume of punches needed to knock down the other boxer makes the game feel unrealistic, repetitive, and boring. In my first bout, I landed over 500 punches (mostly uppercuts to the face) in 6 rounds, knocking my opponent down 4 times but it still went to a decision. Each time I knocked my opponent down he would get up and answer with a short flurry of punches probably due to a temporary increase in his energy, after which I would go right back to wailing on him with uppercuts. Since his face had miraculously healed however, it would take another 100 or so landed punches to send him back down to the mat. If this were a realistic boxing simulation, the other boxer would be dead from blood loss if nothing else. In the end, it all felt like button mashing. As the game gets progressively harder, more defensive tactics are needed to protect yourself against your opponent, but that doesn’t make it more fun. The game has nice detailed graphics and realistic animations, but they do nothing to help the game play. Skip this game and grab Super Punch-Out instead. Neither game is realistic, but at least Super Punch-Out is fun. Buy Boxing Legends of the Ring on GameGavel or Amazon. Tagged Boxing, Boxing Legends of the Ring, Electro Brain, Nintendo, Review, Sculptured Software, Sports, Super Nintendo. Bookmark the permalink.